Tarps are among the most ordinary items you probably have at home right now – sitting in your garage, attic or basement. But did you know that they are the most helpful too? In fact, tarps have many uses during an emergency. Yep, that’s right. In fact, it’s one of the most useful and cheap survival items that you can use in so many ways. Natural calamities like storm or hail can cause severe damage to any roof. And even if the bad weather has already stopped, you can’t always have professionals to fix your roof right away. Covering the damaged area with a tarp is the easiest and quickest temporary fix for a leaky roof. You will only need a few tools and materials to start with, such as blocks of wood, hammer or drill, and measuring tape. Tarps make a sturdy and reliable shelter for livestock. When there’s storm, you can set up a temporary shelter for your livestock. Most animals can get through extreme weather conditions if they can just get out of the rain. Tarps are easy to install and move around. So, in case there’s flooding, you can take them off in the quickest time possible. Camping is fun. But sometimes, mishaps happen. For instance, you might find yourself, your friends or family stuck in the rain. Tarp can be used to cover firewood and anything else that you need to keep dry. Even in your home, you can set up a shed for your firewood and other outdoor items. 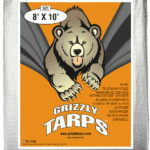 Tarps can be used to protect plants during extreme weather conditions, especially seedlings and other budding foliage. Create a hoop by using small sticks stuck in the ground along the row and hang the tarp around them, using rocks to secure the tarp in place. Stuck in the forest? Whenever you go hiking, you must always carry a tarp with you. 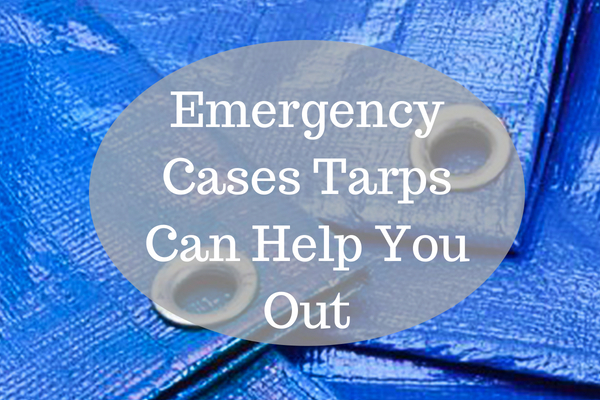 Tarp makes a warm, comfortable blanket in emergency situations. It could keep you dry during heavy rains or snow. Since it’s made of thick poly fiber, the tarp can trap in the body your body heat to prevent yourself from developing hypothermia. A tarp can be used for hunting situations. When the animal is too heavy to carry to your home or camp, you can roll it onto a waterproof tarp and drag it with less effort. You can also use it to drag harvest from your garden to your camp. Together with two long poles and parachute cords or a durable rope, a tarp can be turned into a survival stretcher that can be used to lift and carry an injured companion. Fold the tarp in half to give it more strength. Dig a hole in the ground and then place the tarp inside. It’s a great way to collect rainwater. Saving water even when there’s no shortage in supply is a great way to conserve it. You can use rainwater for your garden or for washing your car and driveway. Organizing a backyard party but don’t have enough time to set build a woodshed? Make use of tarp instead. It’s convenient and easy to install and only requires about two people. You can just add some nice lights and décor to make a pretty, DIY shed. You can take it down easily as well when it’s no longer needed, unlike if you will build a permanent shed. During extreme temperatures and you’re out there camping on your RV, you will greatly benefit from bringing tarps, particular those that are made from waterproof polyethylene plastic. It’s a pretty good protection from rain and flying debris and is easy to set up and remove. Use a tarp to create some privacy when you have to take care of some personal business, such as showering or bathing. For emergency and survival purposes, you want to stock on high-quality, waterproof tarps. Take note that regular tarps wear out quickly. During emergencies wherein extreme weather conditions are involved, you won’t be able to rely much on them. Choose waterproof, high-quality tarps because you’re likely to use them for as long as possible.